The nights are drawing in and the storms are blowing up. Halloween marks the first festival of the Autumn season and we’ve been growing our Jack O Lantern pumpkins since early spring in preparation. 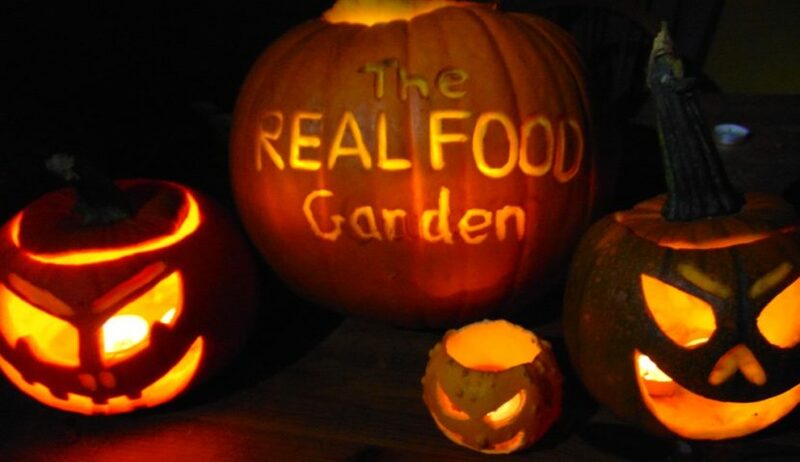 As the last pumpkins go into our veg boxes we’re excited to see not only the culinary delights, but also the lit up faces you might create! These days Halloween is associated with trick or treating, fancy dress and increasingly horror movies at the cinema! Its origins, however, are much more closely linked to the natural world. Whilst we now think of Halloween as very much an American festivity, its roots actually lie in the ancient Celtic festival of Samhain (pronounced sow-in). The Celts celebrated their new year on 1st November, which marked the end of the summer, the season of plenty and harvest, and the beginning of the long, dark, cold winter, the season of scarcity and the death of crops. On the night of Samhain the Celts believed that the lines between the living and the dead were blurred. Ghosts from the underworld would return to wreak havoc on their crops. It also posed an opportunity however, as it was thought that the presence of the spirits made it easier to make future predictions for the seasons ahead. For people entirely dependent on the natural world for their survival such prophecies were a vital source of comfort through the long harsh winter. Just as it was for the Celts all those thousands of years ago, and every year since, we are once again seeing the end of the season of plenty as winter rolls in. For us, its storm Brian, rather than spirits from the underworld, that is wreaking havoc in the garden as October draws to a close, a reminder that we are still entirely dependent on the volatile natural world. Unfortunately we won’t be taking direction from the Celtic deities for the season ahead, but we have hedged our bets on the good old winter brassicas and root vegetables to see our customers through winter….think warming soups and hearty stews! So when you light your pumpkin this Samhain remember to celebrate the abundance of summer and keep your fingers crossed that the weather is kind to us this winter! Budding gardeners love Real Food!